What do you want? CE for less! When will you get it? NOW! We know RDs and nutrition professionals would like continuing education credits to cost less. Hey, we're not protesting that. 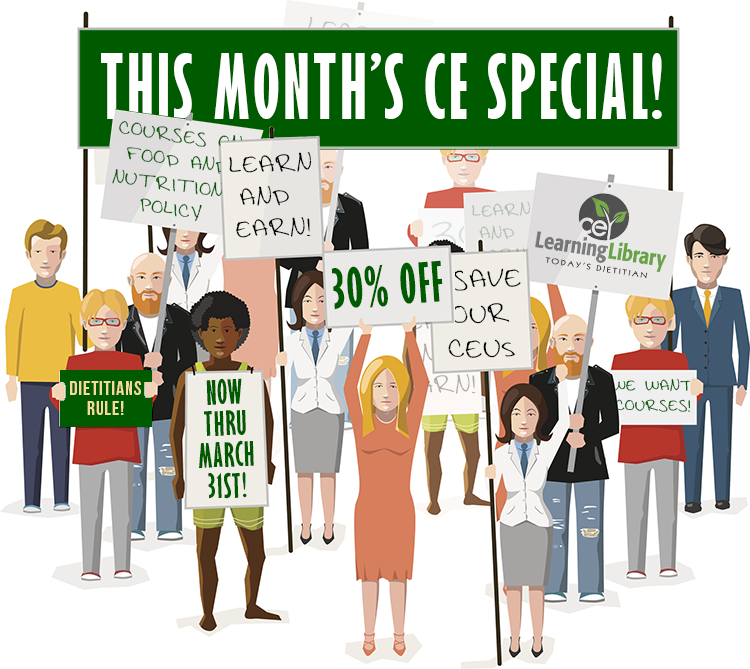 Instead, we're celebrating this March with a 30% discount on courses in our Learning Library about Food & Nutrition Policy and Sustainability. Choose any one of these courses below and apply the Coupon Code MARCH30 at checkout. This offer is good for the entire month of March, ending at 11:59 PM on Saturday, March 31st. Visit CE.TodaysDietitian.com to enjoy this March CE special. Offer valid through March 31, 2018, at 11:59 PM EST.